(Phys.org) --While scientists have become increasingly convinced that the Standard Model of particle physics is incomplete, it's still unclear exactly how the Standard Model needs to be extended. Experiments have shown that the Standard Model cannot explain certain top quark observations, but a variety of extensions of the Standard Model have been proposed to explain them, and it's unclear which extension is correct. 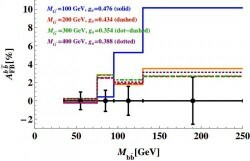 In a new paper published in Physical Review Letters, physicists Benjamin Grinstein and Christopher W. Murphy at the University of California, San Diego, have explained how upcoming data on the bottom quark can be used to distinguish between competing new physics explanations of unexpected top quark data. This is the second plot showing the predicted bottom-quark forward-backward asymmetry (in percentage) plotted against the energy (in GeV units) of the bottom quark-antiquark pair produced in the proton-antiproton collision at the Tevatron. ...more If new physics is involved, as the physicists expect, then the bottom-quark forward-backward asymmetry might be larger than predicted by the Standard Model, or the asymmetry may even be reversed.